Simultaneous interpretation is the most difficult, but at the same time it’s the most convenient and rapid way of interpretation. Simultaneous interpretation is performed simultaneously with the speech of a reporter: an interpreter occupies a special cabin, and his or her interpretation is transmitted through the ear-phones of each listener. Indicator of the high status of an event. Conferences with participants from multiple countries. The simultaneous interpreter profession requires obligatory specialist education, flawless knowledge of the language, and also the high intellectual and cultural levels of an interpreter. Simultaneous interpretation demands high mental strain, hence a pair of interpreters is always employed for a long meeting. 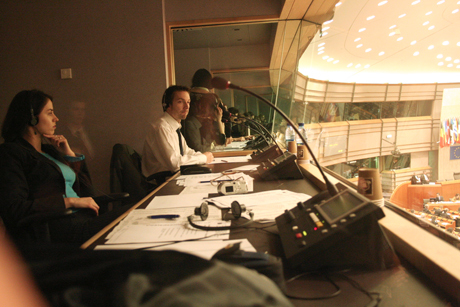 Therefore simultaneous interpretation costs much more than conventional, consecutive interpretation. Our personnel include interpreters of the highest level with long-term experience, working with the first persons of state. Performing simultaneous interpretation during an event also requires special equipment providing technical realization for the interpretation of the reporter’s speech for all the listeners simultaneously.